You'll want to experience the eerie beauty, history and isolation of The Rock by visiting Alcatraz. But, due to strict National Park Service guidelines (the Service runs the park and prison), only a few thousand visitors are allowed on Alcatraz island each day. Therefore it's no wonder that Alcatraz tickets sell out well in advance. But, we have a few tips for Alcatraz tickets the easy way. All Alcatraz tickets & tours include the scenic ferry ride to the island, entry tickets, and an informative 45-minute audio guide. Our strong recommendation is that you book a tour that combines Alcatraz tickets with another activity, and we like these combinations that include a visit to the island with a tour of the city. You get a lot of value, you see a lot, and (the best part) someone else has done all the planning work for you. It's a great way to see our favorite city in the country! We like the classic hop-on-hop-off buses that take you all over the city at your own pace. This also includes Alcatraz tickets and ferry tickets to get you to Alcatraz and back. We think the best part is the flexibility. 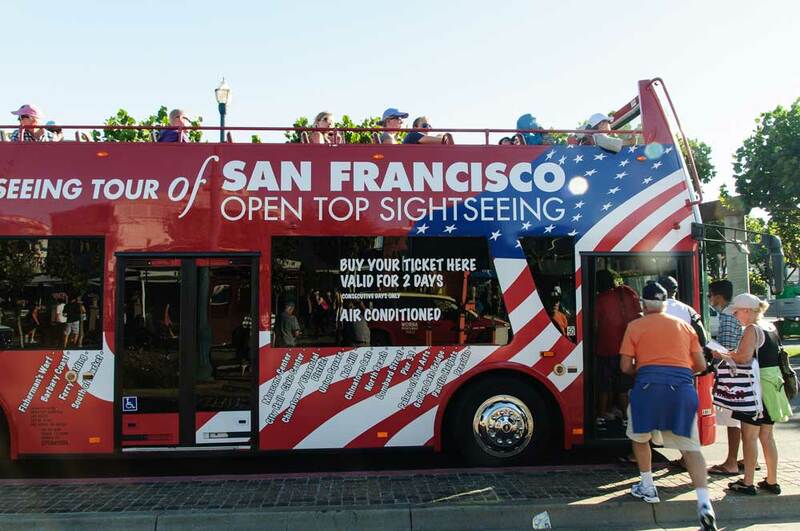 The ticket gives you hop-on-hop-off double-decker bus privileges for two full days, so you can see San Francisco on your own schedule. Relax and ride along the top of the double-decker with the sites below you. A bus ticket like this is one of the best ways to see San Francisco, especially if you don't know the city well. And the included Alcatraz tour is just icing on the cake! This is a comprehensive tour of the City by the Bay, preceded by an extensive visit to Alcatraz. This is particularly good for first-time visitors because you see a lot of the city in an action-packed afternoon, including Chinatown, the Presidio, Fisherman's Wharf, and Twin Peaks, with photo stops along the way. First thing in the morning, though, you make your way to Pier 33 where you hop on the boat for a cruise out to Alcatraz. Take your tie to explore the famous prison island. Just be sure to catch a return ferry in time ofr your afternoon bus tour! You can also choose to include a one-hour cruise around the bay for the following day. Imagine tooling around this fascinating city on one of those crazy fun, two-wheeled Segways. Well, here's a unique tour combining just that with a tour or Alcatraz. You start off by visiting the former prison, complete with ferry cruise, tickets and audio tour. The next day you meet your guide for a 3-hour city tour, seeing the city up close and personal. You cruise past Fisherman's Wharf; see amazing vistas of the Golden Gate Bridge, Ghirardelli Square, Hyde Street Pier and more. Tip: opt for the sunset Segway tour!